On Sunday 27th January 2018, the Haven Centre witnessed a frenzy of activity as visiting Haven members, MBCF staff and a host of volunteers all woke up at the crack of dawn. They put the essential, last minute arrangements in place, ready for our biggest challenge to date: smoothly running a day with eight different medical camps, serving hundreds of patients. The patients would have travelled from far and wide, and some of them would have made the journey through the night due to the distances involved. In the meantime, our catering team had started their preparations even earlier: they began the day before and continued most of the way through the night! A wonderful feast would be ready by 1pm for everyone, including all the patients and their carers, 750 people, to be exact! Timings had to be strict due to the winter season, when daylight is at a premium, so all the camps were to start at 8am and end at 3.30pm, when the meeting to discuss the referred patients would begin. 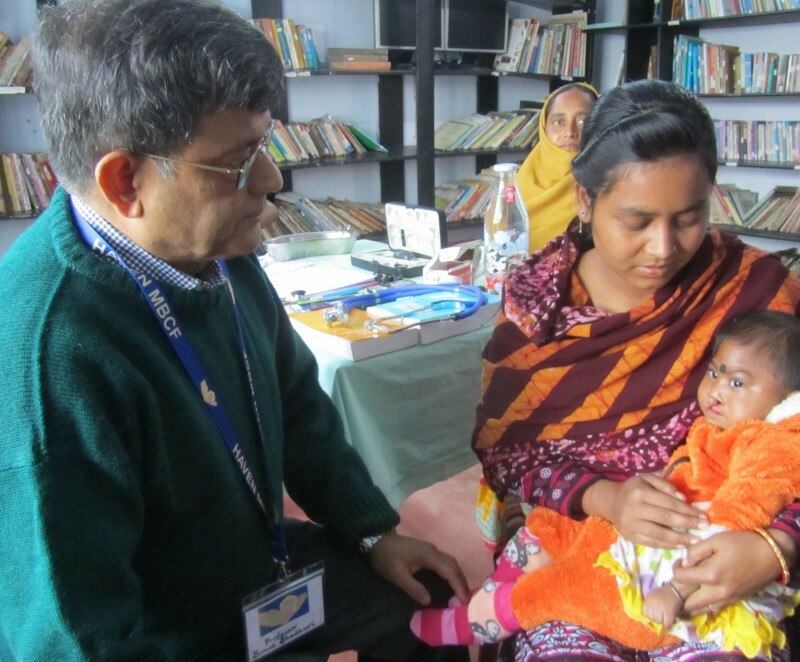 Our veteran consultant and head of our medical board of specialists, Professor Bimal Bhadhuri, returned for his eighth time to run the Paediatric Camp. With his gentle manner, he saw 58 very ill children and pressed for 4 cases to be put forward for referral and further treatment. He also called back a referred patient from the last Paediatric camp, held in November 2017, for further examination, and to discuss more specific ongoing care. This is a partcularly tragic and distressing case of a ten-week-old baby requiring specialised surgery for a heart murmur, without which he will not live to see his first birthday. As per Professor Bhadhuri's recommendations, Haven has already started the process and the baby is being admitted to hospital to be seen by a top cardiologist. Informed decisions can then be taken regarding the correct action to take at the correct time to hopefully save this child's life. Professor Bhadhuri is extremely well regarded among his colleagues and peers and, as a direct result of this, he has been able to recruit more members to our medical board, thereby enhancing the range of expertise we are now able to offer the local population of Atla and the surrounding areas. Thanks to Professor Bhadhuri's heartfelt endeavours in support of Haven's cause, three of the recruits, Professor Ashim Sinha, Dr Manas Chakrabarti and Dr Amit Sinha, took part in these camps. As the Director of Diabetes and Endocrinology and Senior Eminent Staff Specialist Physician at Cairns Hospital in North Queensland, Australia, Consultant, Dr Ashim Sinha, was able to run our first Endocrinology Camp with confidence. Dr Sinha's major interests are in Indigenous Diabetes and General Endocrinology. He holds a conjoint academic appointment as Clinical Associate Professor in Medicine with James Cook University, Cairns and, in 2012, he was awarded the Royal Australasian College of Physician Medal for outstanding clinical services to rural and remote areas. It is no wonder then, that all 58 of Dr Sinha's patients were given the highest levels of medical care and expertise. With his vast experience and knowledge, he provided each and every patient with a considerate and accurate diagnosis and put forward five referrals for further investigation. Gynaecology is one field of medicine that, more often than not, requires the utmost sensitivity on the part of the treating clinician. Consultant Gynaecological Oncologist, Dr Manas Chakrabarti, ran the Gynaecology Camp just so. He proved to be more than able to deal with with delicate issues in a most professional yet calming way. All the women were treated with respect and a high level of expert care and, whether their consultations ended positively or negatively, the women knew they had been given the best possible treatment available. With a passion for research and education, and after serving as a Consultant in the University Hospital of South Manchester UK, Dr Chakrabarti returned to India with a vision to improve women's cancer care. His commitment to research and education is clearly of high importance: presently, he is collaborating with EORTC (European Organisation for Research and Treatment of Cancer) quality of life group and his team is leading the Indian chapter of a 19 country wide international study. Dr Bishaka Chowdhury, also making her fist visit to the Haven centre, very kindly volunteered her help. Thanks to her excellent knowledge and sensitivity all the women felt much at ease throughout their consultations. The two clinicians were able to compliment each other's strengths which allowed the Gynaecology Camp to run smoothly. Together, the two doctors managed to help 58 women and requested 16 cases for referral. Dr Amit Sinha, on his first trip to Atla, took on the biggest camp, the General Medicine camp. With an incredibly high standard of medical practice, he saw a total of 98 patients and put forward 8 referral cases. The quality of his exceptional care of the patients on the day spoke volumes about Dr Sinha and his work ethics. Not surprising really, when taken into account his position as a consultant for NHS England since 2012, for Appraising GPs and Primary Care Specialists to General Medical Council Standard. Dr Sinha is the Managing Partner in a General Practice firm and a Faculty Member for Postgraduate GP Specialty Training. As such, he is able to implement, on a daily basis, his specialist interest in Medical Education and Quality and Standard of Clinical Care. The positive feedback we received from his patients was all due to Dr Sinha's proficiency and competence, coupled with his solicitous care. The General Medicine camp, as a result, was a resounding success. Professor Chitta Chowdhury's long time support and commitment for Haven's cause is noteworthy. Making his third visit to our centre, Professor Chowdhury headed up the ENT Camp in which he saw 68 patients and put forward 6 for referral.With his kind and comfortable manner, he was able to immediately put all the patients at ease. This allowed for relaxed consultations where each patient felt secure and thereby freely able to explain their problem. As a result, Professor Chowdhury was able to understand and diagnose much faster so that each patient swiftly received the correct care they needed. To facilitate his work even further, Professor Chowdhury had painstaikingly brought over a specialised ENT lamp all the way from England. This proved to be most valuable and we are very grateful to Professor Chowdhury for donating this lamp so that it may be used for all our future ENT camps. It has to be said, the ENT Camp was one of the most efficiently run camps of the day! The local field labourers carry out their all-day, back breaking work in paddy fields. They stand in still water for hours and use their unprotected hands in soil where animals have grazed leaving behind their droppings. These are conditions that ultimately have a huge, detrimental impact in terms of skin ailments and diseases. Haven has long been trying to provide the specialist healthcare needed to combat these distressing conditions. So, we were delighted when Consultant Dermatologist, Dr Rajat Sarkar, very kindly volunteered his services to run our first ever Dermatology Camp. Dr Sarkar is renowned in this specialised field of medicine and has many years of experience and knowledge. Having trained at North Bengal Medical College, he now resides and works in Kulti, a small town some 80km distance from the Haven centre. However, because his real home is in Bhagalpur, Atla he is known by all as a virtual resident! Dr Sarkar remarked how nostalgic he felt returning to his home town to help serve the local community. With his careful, considered approach, and his notable medical skills, he was able to provide immediate help and comfort to 65 patients and needed none to be referred. Dr Debashis Bhattacharya, the Founder of Disha-Eye Hospitals, located all across India, had made his first visit to the Haven centre back in October 2016 to run our Ophthalmology camp. This time, due to unforseen commitments he could not personally take part. However, he was very taken with Haven's work on the ground and has become a strong supporter of our mission to provide essential healthcare to those who have no access to such. So, he very kindly offered the services of his colleague, Dr Mrinmoy Dey, from Durgapur Disha Hospital to run this January's Ophthalmology Camp. With 95 patients, all profiled, ready and waiting, Consultant Ophthalmologist, Dr Dey certainly had his work cut out. It soon became apparent to us all that he was more than able and he conducted the camp in an organised, effective manner. All the patients received expert medical care and left feeling much happier than when they had first arrived. In all, 28 referral cases have been put forward and Haven has already started the necessary follow up treatment. Sometimes, it can appear as though medical miracles do indeed happen. Usually though, it is down to hours and hours of the correct guidance, care and expertise that have been put in to bring about this miraculous change for the better. The two professionals from the Indian Institute of Cerebral Palsy (IICP), Asis Ghosh and Tanusree Das know this better than most. The hard work and training they have both put in to look after the needs of the CP patients reached a dazzling conclusion for one child and we were simply awestruck. On the 25th November 2017, just nine weeks before this camp, one little boy was only able to shuffle along on the floor lying on his belly. 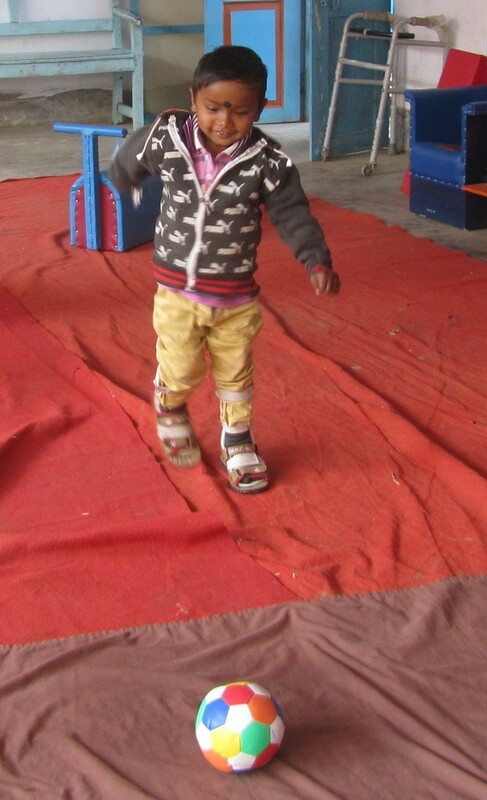 On the afternoon of the 27th January 2018, this little boy showed us his great happiness and his new found skills of walking, running and even kicking a ball, just for the fun of it! 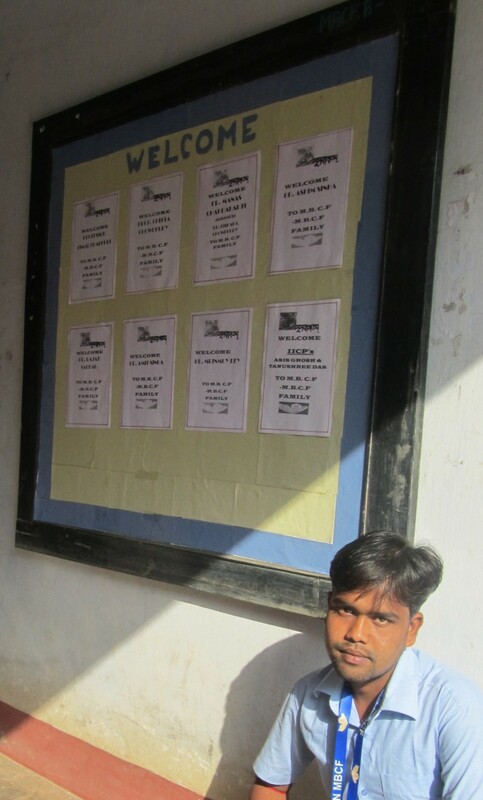 Part of this success story does belong to Tarok, our physiotherapist, and Rita, our nurse. Thanks to the training they have received from the IICP professionals, both Tarok and Rita spent a considerable length of time implementing all they had learnt to ensure this little boy's rehabilitation was carried out to the best. Watching this miraculous scene and seeing his face light up with smiles was one of the most heartwarming moments of the entire day. O ur traditional cultural performance, providing that much needed midday break, this time also took on a completely new look, and another first for Haven. Carefully organised by MBCF Trustee, Nandita Ghosh, the choreographed dances performed by local children, demonstrated entirely different interpretations that had never been seen before. The audience were spellbound at the unique and captivating acts accompanied by songs that had been specially chosen to be in tune with our theme for the day: Hope and Change. Haven would like to extend sincere thanks to Nandita for all her hard work in creating one of the most successful shows to date. Haven's "new look" did much to compliment this amazing day and was yet another first. Thanks need to be given to a kind Haven Committee member for her innovative donation which added just the right amount of style and professionalism to our image. She designed and created our beautifully, emblazoned lanyards to match the official colours of our website. All the clinicians, camp managers and the young volunteers repeatedly commented on how wearing these lanyards made them feel they truly were part of the same team. Our thanks must go to all the volunteers, especially those who had travelled from Burdwan, Bolpur, Kolkata and the UK. A special mention must be made for our guests, the clinician's partners, on their first visit to our centre who flatly refused to spend the day being guests! Instead, they insisted on being involved and put in long hours of hard work to ensure the success of the camps. Samantha Drury should also be included here. With spare time on her hands during a business trip in India, she volunteered her help. It is solely due to Sam that our database is now complete and fully up to date. She spent over six hours in front of a computer screen collating all patient records, and details of each referred patient, including follow up treatments, from all of the eight camps. Thank you Sam! It is no wonder the entire day proved to have so many happy outcomes when, from first thing in the morning, we were put through our paces ready to take on the frantic schedule of the day! With our limbs stretched and flexible, our minds and bodies in perfect balance, we felt calm and harmonious. And, yes we really did manage right up to the end of the referral discussion at 5pm armed with our new found sense of inner peace and supreme unflappability amidst the frenzy of the largest medical camp ever held. This is all entirely due to the expert teachings by Yoga instructor, Jyoti Varma, who had kindly volunteered to run Haven's first ever Yoga session. This proved to be very popular and thankfully, energising! Our thanks to Jyoti and we hope she will return for another visit soon. It has been a privilege to welcome such wonderful support from the largest number of doctors to have graced the Haven centre at the same time. Haven would like to extend sincere thanks to the entire medical team for their dedication and commitment. Their generosity of spirit and kindness is something we will long remember. Our biggest thanks must, and always, go to our loyal partners on the ground, MBCF. Their continued dedication and support allow Haven to go on with essential work in the depths of rural West Bengal and, coupled with their warmth and eagerness, the entire infrastructure in Atla has become a family home we all love returning to time and time again.